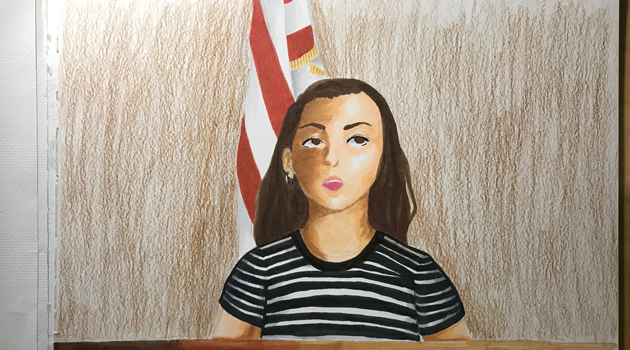 Winners drawing marked Geen Anerine and Jenna Toro (attached) have been awarded Honorable Mention in the NJ State Bar Foundation’s Courtroom Artist Contest for 2018! We are thrilled to see these efforts! The students and their family, and schools’ administrators are cordially invited to the awards presentation ceremony on March 21 where the Chief Justice of the NJ Supreme Court will congratulate the winners. This takes place before the start of the statewide mock trial final competition. The event starts with continental breakfast and photos in the Visitors’ Lounge of the NJ Law Center in New Brunswick. Breakfast will be available beginning at 8:30 a.m. Students, teachers and families will be photographed for the NJSBF website, social media and other communications. Families and schools may also take photos of their own. The presentation will take place shortly after the welcoming remarks at 9:30 in the Auditorium. Students are invited to stay and sketch the mock trial finals, if they would like and have permission from family and school. We understand that is not always possible. The judges of the contest including two nationally-known courtroom artists will be on hand. Liz Williams and Aggie Kenny would love to meet the students and speak to them about their work and developing their skills.